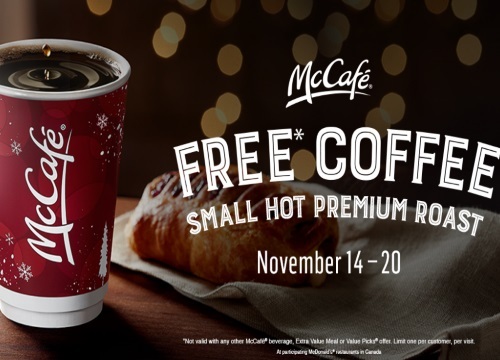 Mcdonalds is offering a Free Small Coffee soon! Get a Free Small Hot Premium Roast from November 14-20 2016. Not valid with any other McCafe beverage, Extra Value Meal or Value Packs offer. Limit one per customer per visit at participating Mcdonalds restaurants in Canada.